When baseball season starts on Thursday, March 28, fans will chow down on yard-long dogs and $15 milkshakes. Major League Baseball's official season opener is Thursday, March 28 — it's the earliest opening day in MLB history — and concession stands across the nation are ready to offer fans peanuts, Cracker Jacks and plenty of wacky alternatives. From Los Angeles to Philadelphia, almost every major league stadium is offering something new, super-sized and super weird for its hungry fans. Root, root, root for the home team ... but if they don’t win, you’ll still have a mouthwatering meal. 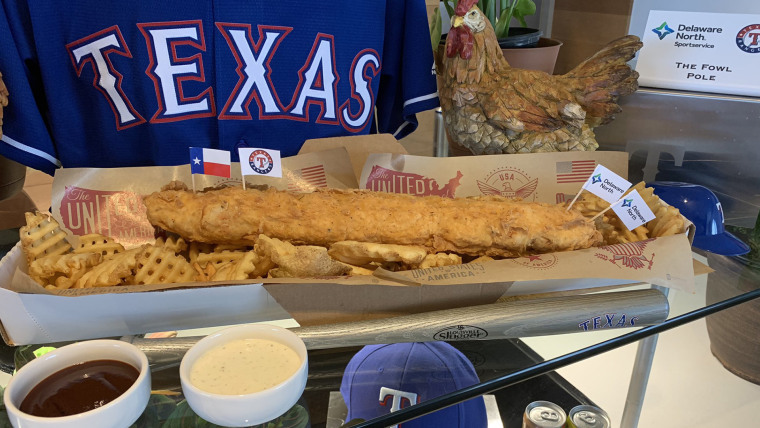 The Texas @Rangers Rangers are selling something called The Fowl Pole this season. It's a single, 2 pound, breaded chicken tender that comes on a bed of waffle fries with ranch & honey dipping sauces. KFC has met its match in Arlington, Texas. Meet the “Fowl Pole”: It’s a chicken strip like you have never seen. It's made with 2 pounds of battered, crispy chicken. It’s served on a bed of waffle fries with honey mustard and ranch dressing for $27.50. Like the Rangers, the St. Louis Cardinals like to go big or go home, even when it comes to food. At Busch Stadium, cooks have created 16-inch slices of pepperoni or cheese pizza. For reference, the diameter of a whole, large pizza is often that same length. True to its name, the pizza pie is a "Mega Slice." The New York Yankees are giving fans with a sweet tooth an extra-special milkshake this year. The Tres Leches Shake, the Celebration Shake, the Pinstripe Shake and the Chocolate All-Star Shake will each set you back a whopping $14.99. The Tres Leches Shake, the most unique of the bunch, is a vanilla shake with tres leches cake pieces, churro pieces, condensed milk and a rim garnished with puffed rice. The Phillies are throwing a curveball with a salty and sweet burger combo this season. It’s called the "Donut Burger," and it’s just as decadent as it sounds. Boardwalk Eats places a juicy burger patty in the middle of a glazed doughnut, then it's topped with melted American cheese, crispy Applewood bacon and a spicy cherry pepper jam. Baseball hats aren’t just for heads. The Dodgers are filling miniature helmets with sweet, Mexican-style grilled corn, topped with mayo, cotija cheese and chipotle aioli. You can get this dish in a regular bowl, too … but why in the world would you do that? Beyond the corn helmet, the Dodgers are grilling up yard-long sausages. Cooks start with a jalapeño-bacon cheddar sausage topped with sauteed onions, roasted corn and avocado relish. Sour cream is optional. The Twins combined two of the best flavors known to man — peanut butter and bacon — into a single sandwich. First, crispy bacon is glazed with a mixed berry jelly, then it gets layered in between two pieces of peanut buttered, sourdough toast. The creamy peanut butter complements the crunchy bacon.